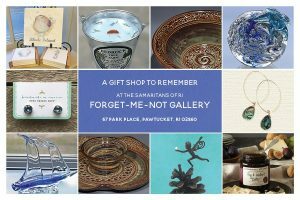 The Samaritans of Rhode Island | A GIFT SHOP TO REMEMBER! The Forget-Me-Not Gallery & Gift Shop is stocked with unique gifts created by local artists, such as Robert Fishman Pottery, Bedrock Tree Farm, Glass Studio of Cape Cod, Paint the Town, Denise Auger, Providence Art Glass, Stonewall Kitchen, Owen Sheff, Narragansett Indian Tribe, Eric Auger, Noon Design Shop, Alex and Ani and more! Most purchases of handmade artists’ wares from the gallery and gift shop are state sales tax-free! 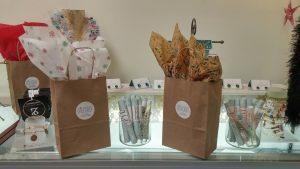 Our gift shop features affordable gift giving ideas such as jewelry, candles, hand blown glass, magnets and more. Shop local! Support local! Your purchase comes ready to give with a gift bag, tissue paper and a beautiful brochure showing your gift giving benefits The Samaritans! We will reopen soon. Need something sooner? Give us a call to arrange time for a visit! Please note: We are very small gallery and from time to time, we might have to leave to run errands. Note: Checks, credit and debit cards preferred. No cash transactions. Thank you!